other SoCal physicist wannabes including Math Whiz Dave, Left legacy coding for full time physics study, Larry, and Real retired physicist, Dr Robert. Unfortunately, other members of our little science squadron couldn't make it and I was especially sad not to get together again with Looking for gravity waves, Dr Gary, who had to change plans at the last minute. Anyway the rest of us got to listen to actual physicists discuss their latest findings on astrophysics, cosmology, particle physics and gravitational research. Now, I had not been back to Salt Lake more than once or twice since I attended university there 40 years ago. I had forgotten how beautiful the snow capped mountains could be. See attached photo. I had also forgotten how cold it could get in April and pretty much froze my SoCal blood until I purchased an emergency jacket. 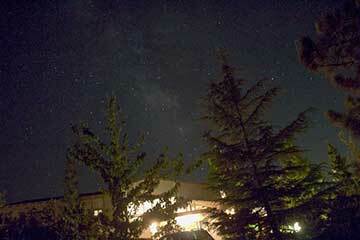 I forgot to even look up at the sky to see what stars were visible. Now at least we were in the bright city center, right next to the Salt Palace Convention Center, so that might have been part of the reason to not to look up too. Another reason that some folks might say interfered, bot not me, was that my martini affected brain had to concentrate on how my feet contacts the sidewalk and that I couldn't afford to look up. There actually might be some truth to that in that I met up with my Niece Connie for dinner and had a mini reunion with her husband and kids. That was a lot of fun and it was also an occasion to recall some of the liquor laws to be found there. I arrived at the a Cheesecake Factory before everyone else, so I asked it I could wait in the bar. I ordered my favorite lemon drop martini and was asked if I was going to order dinner. Yes, I said, but that I was waiting for the rest of my party. Well, it turns out that the liquor license did not allow me to just have a martini and that I would also have to order food. The waiter took pity on me and just brought me some bread while I waited. I asked if I couldn't just transfer the tab to the restaurant once we would be seated, but again, not this was against the rules too. Oh well, Connie and team finally arrived and all was well. So here it is that I thought studying physics was hard but I wonder how long it takes to master the liquor laws. One of the topics of interest to me was that of neutrino astronomy. Neutrinos are formed during many significant astrophysical processes, such as fusion in stars, and can travel vast differences because they don't interact much with anything at all. They are the onLy way to see what goes on deep inside the sun or other stars. So even though they are hard to detect, they can tell a lot about the far away conditions under which they were produced. The other topic, which was the subject of several dozen presentations was the detection of gravitational waves in an event, known as GW150914, which was caused when two black holes merged, in this case about 1.2 billion years ago and about 400 megaparsecs away. This discovery was the first time that gravitational waves were discovered and this discovery opens up a whole new spectrum for observing the early universe. I had previously reported on the discovery and this time have posted another image of the range of possible mergers that can eventually be detected. The chart image from one of LIGO/LISA status reports shows what the frequency of the detected gravitational waves would be for a range of objects from black holes to ordinary binary stars. The frequency for GW150914 was about 350 hertz, right in the neighborhood of middle C on the piano. For smaller objects, like binary neutron stars or sun sized binary stars, the frequency would be much lower in the millihertz range. This new observational technique will be able to prove back into the very early stages of the universe, maybe even echoes from the Big Bang. Now several internet threads have discussed whether we would actually be able to hear an event similar to GW150914, if it were much closer. The frequency would be the same and if it were say 100 million times closer, the strain due to gravitational wave distortion would be about 1 part in a million rather than about 1 part in 10 to the 21st power. The intent threads, even on physics type sites, say that we would actually be able to hear such events because the ear drum and internal workings would vibrate allowing us to hear the wave. Well, I find myself in the minority on this topic because to me the gravitational wave would cause distortions in space time as described, but it's not clear this distortion could actually be detected by the ear. My thought experiment is to consider a ruler next to the persons ear. Any distortion of the ear would also distort the ruler so any stretching for compression in the direction perpendicular to the direction of the wave would show up in both the ear and I. The ruler. This suggests to me, that the observer would detect now visible or audible change in length because the ruler changes just as much as the ear does. So, you may ask, how did the scientists detect GW150914. Well they used the speed of light, which is constant in all reference frames, to measure the slight distance changes caused by the passing gravitational waves. So to me, we would. It be able to hear the wave. So, am I missing something in my analysis? I wish I had thought of this at the APS meeting where I had access to a lot of experts. I even saw Dr Janna there and I sure would have liked to talk to,her again and I could have asked her that question, but alas it was not to be. You can find more details regarding the calculations for gravity waves in Sean Carroll's "Spacetime and Geometry". I had hoped to double check how the energy of the gravitational wave would couple to matter in its path, such as our ears, but he said energy calculations are very difficult and not included in his text. Just ordinary calculations are very difficult for me, so tackling these other issues is not possible for me now.